A snowplow driver in Cleveland has been suspended from his job after displaying an anti-Bush sign. When President Bush visited Cleveland this week, Michael Gerstenslager, a highway maintenance worker, was asked to help provide security for the president's motorcade by using his snowplow to block access to a highway entrance, the Cleveland Plan Dealer reported. 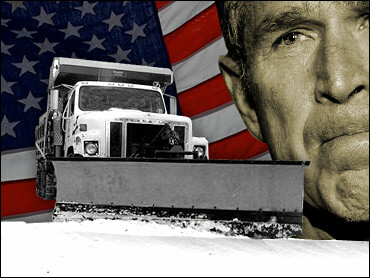 Gerstenslager hung a sign on the side of the plow that said "traitor" – a message aimed at Mr. Bush. A state trooper in the president's motorcade saw the sign and reported it to the Ohio transportation department. A spokeswoman for the agency says the driver has been suspended with pay while his actions are investigated. Gerstenslager couldn't be reached for comment. A spokesman for the Ohio Civil Service Employees Association, the union that represents the Gerstenslager, called the incident "fairly innocent."